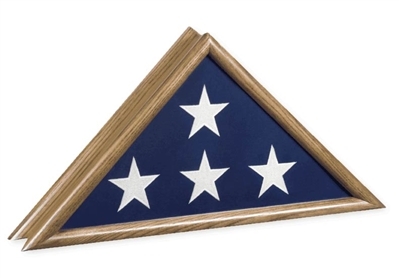 Display the American burial flag of a courageous loved one with a patriot flag display case. Each patriot flag case – available in classic oak finish with a serpentine profile – is made in the US from solid Oakwood. Each patriot flag case includes a free brass nameplate and free wall mounting hardware. The Patriot features a unique serpentine profile with classic Oak finish. Profile looks outstanding wall mounted. Includes a glass front and Oak finished back panel.